Artists Win FREE Billboard for a Year! A New billboard competition will award one creative student billboard exposure for an entire year! We know, from the success of billboards, how monumental this could be for that artist. 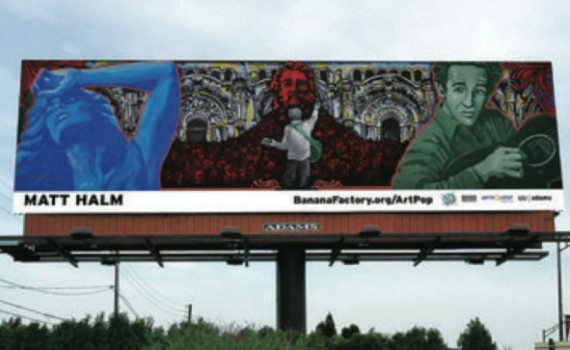 The ArtPop Lehigh Valley Billboard Program fired up in 2014 and is a public art program focused on highlighting local artists and the roles they play in communities by featuring their work on popular billboards. The works of six artists are featured on Adams billboard’s for all of 2015. The cool thing is that ArtPop will add a student contest in 2016, awarding one lucky student the same honor: their original artwork on display on an Adams billboard for all of 2016. The ArtPop Scholastic Competition will be open to Lehigh and Northampton county high schoolers. But, here at Arizona Billboard Company, we think this should be reproduced in other local areas because of the value it can add to every community.